November 5, 2016--This is the project I stitch when meeting fellow stitchers and want to do more socializing than serious counting or decision making. It's all done in basketweave with Vineyard Silks that don't need laying. So far all the black, charcoal, red and dark blue colors are stitched. Now to finish the medium blue areas. Once that's done, the purples, yellows and grays should go fast. Correction--should go a little faster--this project is still going to take years to complete. Here's what it looks like today. April 6, 2016--All the red is stitched, as well as the blue columns and the charcoal grey area. It's a great project to do when listening to complex dialogue in an audio book or movie. It took awhile to finish this color since I ran out of the Vineyard Silks dyelot I was using. With only an inch or so to stitch, I placed a search on Facebook's Needlepoint page and voila, a kind soul checked with her LNS who in fact had what I needed. Happiness is a wonderful needlepoint community. February 20, 2016--Started stitching this cool project and even though I'm not a big fan of painted canvases, I'm enjoying this one. Firstly, I decided to work it all in basketweave or tent stitches because I'm going to make this into a "wristlet" type of purse and don't want to catch longer, fancier stitches on anything. Secondly, even though it's being worked in boring basketweave, the design itself has its own challenges in the fact that the diagonal lines aren't on a true diagonal. I'm required to baste the lines to visually guide me up and down the canvas (see photo below). At the rate I'm stitching these days, I figure it'll take me 3+ years to complete this thing. LOL. PS I'm not stitching this "in hand" as I wrote below--too cumbersome for basting stitches. January 21, 2016--A week or so ago Art Needlepoint Company of Canton, MA asked Facebook needlepointers to post a picture of their favorite stitching chairs, etc. and a lucky winner would be chosen to win a canvas worth up to $100. Well, guess what--I won and here's the photo I sent them (click here). The 18 count canvas I chose is called Wavelengths, measuring 20" x 6.5" and can be made into a clutch purse or wristlet measuring 10" x 6.5". I also chose to stitch it using Vineyard Silk threads (which they recommend). The design is an adaption of an old textile pattern. 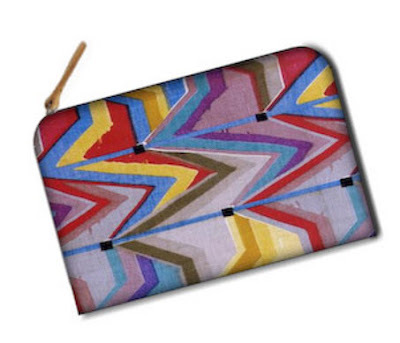 Here's a picture of it made into a small clutch. I love all the sections for applying various stitches or I may just decide to stitch it "in hand" using only tent stitches. Project Photo from Art Needlepoint Co.
Congrats! Nice selection & love your chair story. Feels good when you're organized.